After 4 years of living in Belgium, I realized, to my great dismay, that Belgian gardens have been greatly under-represented on this blog. Isn’t it so often true that we ignore what we have at home and look away for inspiration? In my defense, I think I can explain why this happened. First, Belgium is surrounded by some of the finest gardening nations in the world – the Netherlands, Germany, France and the UK. The temptation to go beyond the borders is therefore somewhat understandable. But given its illustrious neighbors, one might also naively think that Belgium is the place where these influences come together to create a gardening epicenter. Alas, it is not so. 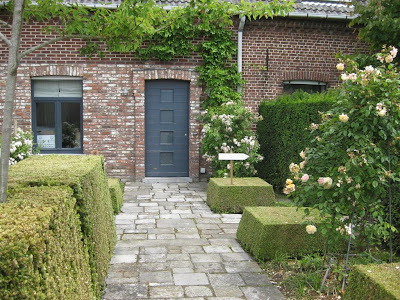 As I discovered soon after moving, the most important criteria in shaping the Belgian landscape are neatness and practicality, resulting in some rather sterile gardens. 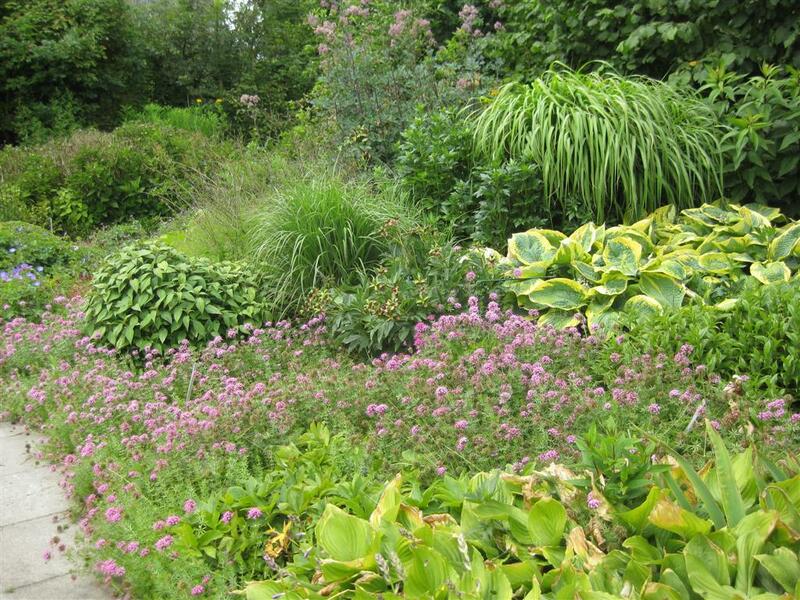 What the Belgians seem to love more than anything else are immaculate lawns, tight hedges, and all manner of pruned, trellised, pleached and espaliered plants. I believe nothing delights the average Belgian more than running outside the instant a new leaf grows beyond the planned geometry of the garden and promptly snipping it off. Although this may sound like mocking, I have gained a lot of respect for the Belgian approach to landscaping. Training plants into geometrical shapes can be a very valuable tool in the landscape, one that I think is under-used in North America. In Belgium, the technique has been greatly refined over the centuries, and is now perhaps best embodied by the innovative work of Jacques Wirtz. Unfortunately, most of his work is in private gardens and estates, and therefore not accessible to the lowly blogger. A Wirtz hedge in his private garden. More on his work can be found in this nice article in the NY Times as well as a post on Grounded Design, where I found this picture. Instead of Wirtz’s iconic work, I will talk about some small, private, and more plant intensive gardens that I visited as part of the Belgian national open gardens scheme. 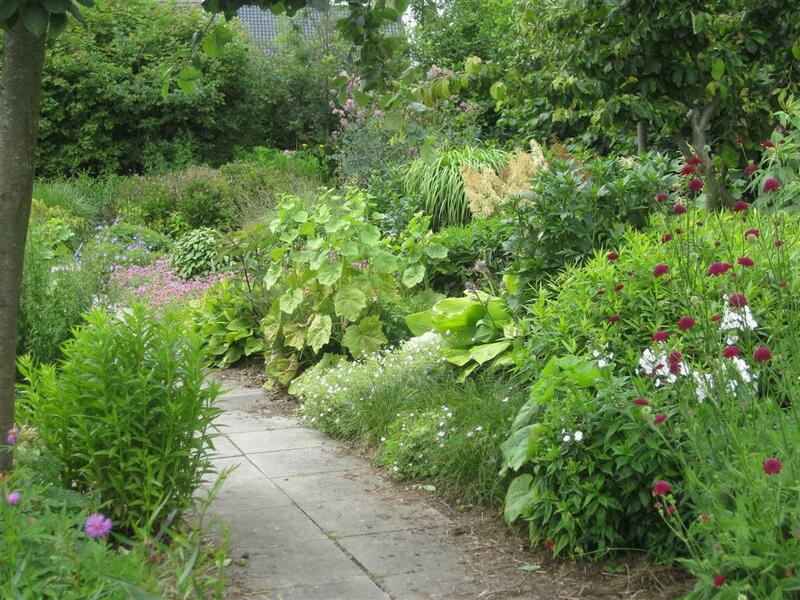 The first was Wim van Wassenhove’s garden. I actually went to this one by mistake, but after spending 2 hours getting there by bus, train and foot, there was no turning back (and I certainly don’t regret it). 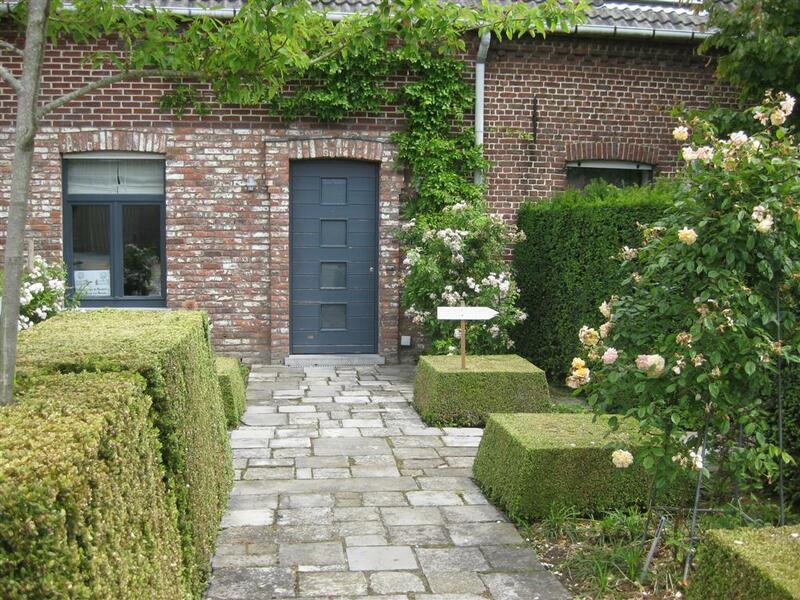 Van Wassenhove is a landscape designer and nurseryman practicing in the western part of Flanders. Immediately upon entering his garden in the tiny village of Zedelgem, it’s clear that he also has a healthy level of that famous Belgian hedge gene. Neatly trimmed boxwood greets the visitor at the front door, and a tall yew hedge carefully encloses the entire front garden. The path and hedges leading up to the front door, and the gate to the front garden. At the back of the house, hedges are again in the spotlight. The backyard is defined by strong horizontal and vertical lines. The horizontal lines build up in layers, starting with the brick terrace, then the long rectangular pond that parallels the terrace, followed by the dividing line between the lawn and field, and finally the horizon line. As you go away from the house, the lines get increasingly less defined, amplifying the sense of depth. At right angles with these are the strong verticals, represented by neatly trimmed hedges. 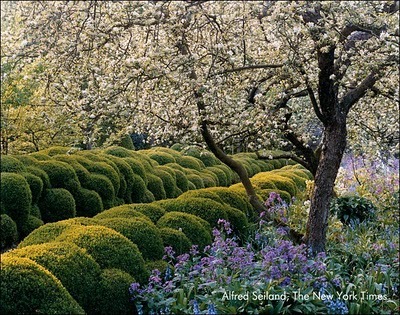 The hedges are quite narrow, and run in parallel rows that lead the eye out to the larger landscape. Van Wassenhove is, by the way, the designer who told me he uses laser guides to install and trim hedges in clients’ gardens to ensure perfect straight lines. Moving from the back of the house to the end of the garden reveals the details of the horizontal and vertical structures. The long rectangular pool is a more formal version of the small canal dividing the property from the fields at the back of the garden. The central axis is very powerful, but a lot is happening on the sides as well. Neatly trimmed boxwood rectangles are scattered throughout and combined with level changes to create an interesting play of geometrical shapes. The picture is softened by looser plants inserted in between, creating a nice overall balance. Trimmed boxwood, loose plantings and creatively used sculptures and accents work together to create a balanced and interesting picture. In addition to this garden, which is quite ‘designed’ and I think pretty representative of the Belgian style, there is a second flower garden. This secret garden is completely out of the way and separate from the main garden, concealed behind the greenhouses and potted beds used for the nursery. This is very typically Belgian – to hide the loose and flowery bit somewhere in the back, and treat it almost as a play area that shouldn’t interfere with the real garden. This flower garden looks almost like a nursery itself. It’s set up as several parallel paths with borders in between (instead of potted plants). There is a lot of plant material here, and it is well grown. Obviously van Wassenhove loves his plants, even if he chooses to only use them sparingly in the rest of the garden. I visited in the middle of June, which wasn’t yet the peak for this garden. 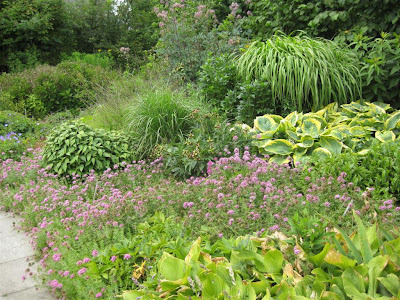 There were a lot of ‘new perennials’ in the mix (no doubt the Dutch influence next door), but surprisingly few grasses. It seemed like more of a traditional English border, but using modern plants. 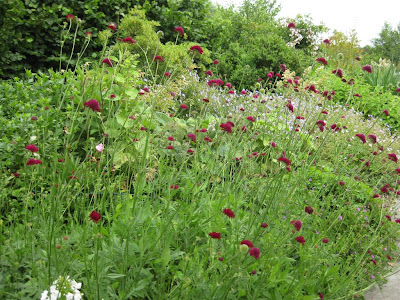 Plants such as Knautia macedonica, cranesbill geranium and some roses were the highlights in early June. The purple groundcover in the bottom picture is Phuopsis stylosa purpurea, a plant new to me. The last area of the garden was the most naturalized. It followed a small canal, of the kind traditionally used to divide fields in the lowlands. 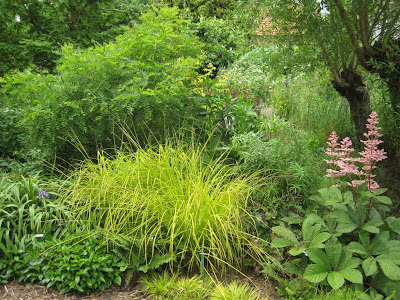 In this narrow, boggy area, named varieties of plants mingled freely with gnarly, pollarded willows and field grasses. It seems that the Belgians can let loose after all, even if only in the furthest recesses of the garden. I think I'll take the Wirtz, though this garden is fascinating. I find what I don't particularly care for is as interesting as what I like, actually more so. This garden makes me think. Thanks for the (too infrequent) post. That's a really good point James. I actually thought when I started the post that it wasn't really my sort of garden, and what could I say about it? But having to write something forced me to take a closer look and I realized I could learn a lot. Glad it was also of interest to you. Last few days I was looking for exact this information from here to there & finally its on your blog site. I'm really happy with your blog & will share it with my friend.